Technical standards covered include the full API ‘body of knowledge’ for the examination, i.e. 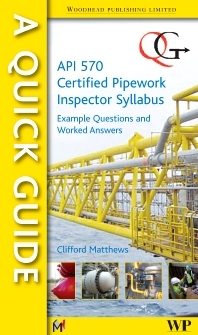 API570 Piping inspection code; API RP 571 Damage mechanisms affecting fixed equipment in the refining industry; API RP 574 Inspection practices for piping system components; API RP 577 Welding and metallurgy; API RP 578 Material verification program for new and existing alloy piping systems; ASME V Non-destructive examination; ASME IX Welding qualifications; ASME B16.5 Pipe flanges and flanged fittings; and ASME B 31.3 Process piping. Section 1 The main principles: Interpreting ASME and API codes; An introduction to API 570; More advanced API 570; API 574; API 578; API 571. Section 2 Welding: Introduction to welding/API 577; General welding rules of ASME B31.3 and API 570; Welding qualifications and ASME IX. Section 3 NDE and other testing; The NDE requirements of ASME V. Section 4 Pressure design: B31.3: Pressure design; ASME B16.5: Flange design. Section 5 Example questions: Example open-book questions; Answers. Clifford Matthews CEng, FIMechE is Director of Matthews Engineering Training Limited, UK, which runs training courses in API 510/570/653, plant inspection, code design, pressure relief equipment and related subjects: over 4000 delegates have been trained in the past 10 years. He has worldwide experience in various industries and is the author of several books on topics relating to inspection. Matthews Training’s approach to teaching API subjects has achieved a first-time examination pass rate in the region of 90%.The company is an authorised global training provider to the American Society of Mechanical Engineers (ASME).